This is the longest and perhaps most perilous week for Trump so far. Not only did House Speaker Nancy Pelosi outmaneuver him in the government shutdown, but by week’s end she was publicly questioning if Trump is beholden to Russian President Vladimir Putin, and if his campaign coordinated efforts to subvert the 2016 U.S. election. Meanwhile, House committees, now chaired by Democrats, geared up to challenge Trump and his regime on a number of fronts, including inquiries into Deutsche Bank’s handling of Trump’s accounts and the regime’s process of granting of security clearances. Following dire warnings from agencies, unions, and former government officials about safety and security risks, public outcries and protests from unpaid furloughed workers, and plummeting approval, Trump finally agreed to reopen the government Friday. The final impetus appeared to be delayed flights at New York’s LaGuardia Airport due to staffing issues with unpaid air traffic controllers. This week a sixth Trump insider, Roger Stone, was indicted on seven counts Friday, raising further concerns that the Trump campaign coordinated with Russia to subvert the election. A line in the indictment document, “a senior Trump campaign official was directed to contact Stone,” left pundits speculating if the person directing Stone to gather information on the WikiLeaks’ release of Clinton Campaign emails stolen by Russia was Trump or a family member. Trump attorney Rudy Giuliani also made incriminating public statements about the timing of Trump’s discussions with Michael Cohen on the Trump Tower Moscow project, as Trump continued to publicly threaten Cohen and his family, raising concerns of witness tampering. WAPO reported Trump has made 8,158 false or misleading claims in his first two years in office, including more than 6,000 in the second year alone. Trump averaged 5.9 false or misleading claims per day in his first year in office, and almost triple that, 16.5 per day, in his second year. The biggest topic of Trump’s misleading claims is immigration. On Saturday, Trump gave a 13 minute speech in which he offered a 3-year reprieve on his attempts to end the Deferred Action for Childhood Arrivals, and temporary protected status, in exchange for $5.7 billion for his wall. The proposal was put together by a small group of Trump insiders, without consulting Democrats. House Speaker Pelosi called it a “non-starter,” and vowed to pass legislation in the coming week to reopen the government. WAPO reported Trump’s speech and handling of the shutdown accentuated traits of his time in office: a shortage of empathy; difficulty accepting responsibility; and a desire for revenge against political foes. Trump has approached the shutdown like a public relations challenge. White House aides acknowledge he is losing the battle of public opinion. One friend said even if his base is intact, he is ripping the nation apart. Trump has also drawn criticism for his competence as an executive. West Wing aides acknowledge they had no contingency plans for the shutdown, and are learning about problems at agencies though reporting in real time. On Sunday, Brett McGurk, the former U.S. envoy to fight against ISIS who resigned after Trump announced withdrawal from Syria, told “Face the Nation” that “there is no plan” for what comes after troops are withdrawn. On Sunday, amid trade negotiations between the countries, China granted Ivanka Trump’s company preliminary approval for another five trademarks. The applications were filed in 2016 and 2017. On Tuesday, NBC News reported according to a report from Beyond Parallel, a project sponsored by a defense think tank, North Korea has as many as 20 undisclosed missile sites in the country. Reportedly, some Trump officials and U.S. allies are nervous because they know so little about what Trump and Kim Jong Un talked about in Singapore, and are concerned about what Trump might agree to next. On Sunday, Rudy Giuliani told “Meet the Press” that discussions to build a Trump Tower in Moscow remained an “active proposal” as late as November of 2016, months later than Trump previously publicly admitted. Giuliani said Trump can “remember having conversations” with Michael Cohen “throughout 2016.” Cohen admitted he worked on the project through June 2016, after telling Congress talks ended January 2016. Hours later, in an interview with The New Yorker, Giuliani said “I have been through all the tapes” of conversation between Trump and Cohen. The existence of tapes had not been previously discussed. Vanity Fair reported Trump is “furious” about Giuliani’s recent botched press appearances. Reportedly Trump is being advised by Ivanka and Jared and others to fire Giuliani before he does more damage. AP reported that Trump’s close allies have urged him to bench Giuliani, with some suggesting he be barred from evening interviews because of concerns that he was going on TV after drinking. On Monday, NYT reported that a confidential document, titled “Terms of Removal” and signed by representatives of Oleg Deripaska and the Treasury Department, is significantly different than what has been publicly shared. The Treasury Department described the broad contours of the agreement in a letter to Congress, which was released publicly. However, major details were not provided to Congress, which voted last week. The deal is significantly less punitive and contains provisions that free Deripaska from hundreds of millions of dollars in debt, while leaving him and his allies with majority ownership of his most important company. Despite the Treasury Department indicating that Deripaska had lowered his stake in the sanctioned companies below the 50% threshold to 44.95%, the document reveals the actual overall stake is closer to 57%. Also Viktor Vekselberg, who has attracted Mueller’s attention, has a stake in Mr. Deripaska’s empire, as does Len Blavatnik, a Ukrainian-born billionaire, who donated $1 million to Trump inauguration. On Monday, Russian opposition leader Alexey Navalny announced he has heard audio recordings of Deripaska’s associates plotting to have Anastasia Vashukevich arrested. Vashukevich was supposed to be deported, when released from prison in Thailand, to her home to Belarus, but instead she was arrested during their layover at Moscow in connection with a prostitution case. On Tuesday, Vashukevich, who said she had evidence Russia interfered in the U.S. election, was freed from Russian police custody. TASS News reported she remains a suspect in an unrelated criminal case. On Tuesday, ABC News reported congressional investigators are looking into Robert Foresman, now vice chairman of UBS’s investment arm, who lived for years in Moscow and led a $3 billion Russian investment fund. Foresman, who has ties to the Kremlin, sought a sit down with Trump through the producer of “The Apprentice,” Mark Burnett, during the transition period. Burnett helped get him a meeting with Tom Barrack. The meeting with Barrack was canceled, but Foresman continued to pursue a role on Trump’s team by meeting with Michael Flynn. Foresman did not support Trump in the primary or general election. Records also show Foresman had a December 2016 meeting with Sergei Gorkov, chairman of a state-owned Russian development bank. Gorkov also flew in for one day in December for a meeting with Jared Kushner. On Tuesday, the Supreme Court allowed the mystery foreign government-owned company thought to be part of the Mueller probe to file appeal papers under seal. On Saturday, the Diocese of Covington criticized any students involved in taunting Native Americans at the Indigenous Peoples March, adding the matter is under investigation and students could be expelled. On Monday, USA Today reported the Sandmann family hired Louisville public relations firm RunSwitch PR, which was instrumental in a 3-page statement in which Nick defended his actions, and an extended video. ICE arrested Carmen Puerto Diaz at a green card interview with her husband. Diaz, who is five months into a high risk pregnancy, was denied medication for days, and was later released after public outrage. Star Tribune reported coach Michael Walker, whose high school team is predominantly black, pulled out of a MLK Day game in Minneapolis, citing the host team had a front row Trump 2020 banner last time they played. On Monday, Mark Bartlett, 51, was arrested in Florida, after a video showed him drawing a gun, and yelling racial slurs at a group of Black Americans participating in an anti-gun violence event on MLK Day. On Tuesday, the Supreme Court ruled 5-4 to allow Trump’s transgender military ban to proceed, clearing the way for it to go into effect while lower courts hear additional arguments. On Tuesday, the Supreme Court took no action on the Trump regime’s appeal in the “Dreamers” case, leaving the program in place, and signaling that the court will not hear the regime’s challenge in the current term. Trump, who tried to end the program in 2017, said in a cabinet meeting this month that he had expected to use a victory in the Supreme Court as leverage in negotiations with Democrats on immigration. On Tuesday, Trump’s Justice Department said it plans to ask the Supreme Court to take up hearing the case on adding a citizenship question to the 2020 census on an expedited basis in order to decide the case by June. On Tuesday, the day after Sen. Kamala Harris announced her 2020 presidential run, Trump supporters rekindled birtherism, claiming she is not eligible to run because her parents were not born in the U.S. Harris was born in Oakland. On Wednesday, James Jackson, a 30 year-old white supremacist, pleaded guilty to killing a Black man with a sword in New York. Jackson had planned to carry out many attacks against Black men. On Wednesday, Colorado police arrested Christopher Cleary, 27, who threatened to kill “as many girls as I see,” because he is a virgin and had been rejected by women multiple times. On Wednesday, the Trump regime granted a waiver to give Miracle Hill Ministries in South Carolina permission to participate in the federally funded foster-care program, even though the group openly discriminates. Miracle Hill does not permit adoption by LGBTQ and non-Christian parents. The waiver overrides an Obama-era regulation barring groups that discriminate on the basis of religion from receiving federal money. On Thursday, newly-appointed Florida secretary of state Michael Ertel resigned after photos emerged of him posing as a Hurricane Katrina victim in blackface at a private Halloween party 14 years ago. On Thursday, NBC News reported the Trump regime plans to begin turning asylum-seekers back at the southern border on Friday to wait in Mexico under a new policy designed to crack down on immigration. Customs and Border Protection officers will begin turning back asylum-seekers from Central America at the San Ysidro port of entry in California from Tijuana, Mexico, where thousands are waiting in poor conditions. Currently, immigrants who pass an initial “credible fear” interview are allowed to remain in the U.S. to see an immigration judge. The new policy dubbed Migration Protection Policy is likely to be sued by advocates. Beginning Friday, asylum-seekers will be sent back to Tijuana with a notice to appear in court in San Diego. On their court dates, I.C.E. will provide transportation from the port of entry to immigration court. On Monday, Trump marked Martin Luther King Jr. Day with a 2-minute visit to Washington’s Martin Luther King Jr. Memorial. This was Trump’s only public event for the day. On Monday, National Review reported that Rep. Joe Neguse said the House Judiciary Committee will likely investigate whether Supreme Court justice Brett Kavanaugh committed perjury during his confirmation hearing. On Tuesday, a North Carolina Superior Court judge denied Republican Mark Harris’ request to certify the still-disputed 9th District congressional race, saying the Board of Elections should complete its investigation. On Tuesday, the House voted 357-22 on legislation to prevent Trump from pulling out of the North Atlantic Treaty Association, after reporting that Trump considered pulling out during 2018. The bill will now move to the Senate. On Wednesday, Trump backed a coup in Venezuela by opposition leader, Juan Guaidó, the 35-year-old National Assembly leader. President Nicolás Maduro dismissed Guaidó’s claim to the presidency. Maduro responded by giving American diplomats 72 hours to leave the country with a derisive “be gone!” and accused the Trump regime of plotting to overthrow him. The U.S. said it would ignore the deadline. The Transportation Security Administration reported TSA employees called out at a national rate of 10% on Sunday, a record high and a jump from 3.1% one year ago on the same weekend. A TSA spokesperson told ABC News we are in “uncharted territory.” Employees say they are unable to continue to unpaid work, and at February 1, when rent and mortgages are due, things will get worse. On Tuesday, Politico reported furloughed federal workers are running up credit card debt, taking out loans, flocking to pawn shops, finding temporary work, and asking friends and family to help. A spokesperson for the Consumer Bankers Association, which represents retail lenders, said calls for help have picked up tenfold, and will increase further nearing February 1 when mortgage and rent payments are due. On Tuesday, a report issued by the FBI Agents Association, the group representing 13,000 agents, said the shutdown has impeded the agency’s efforts to crack down on child trafficking, violent crime, and terrorism. The 72-page report says the FBI has been unable to issue grand jury subpoenas and indictments in several cases. Field offices have run out of basic supplies like copy paper, forensic supplies, and DNA swab kits. On Tuesday, the State Department canceled the 16th International Export Control and Border Security Conference, focused on border security and scheduled to take place in Scotland in mid-February, citing the shutdown. Sanders has not taken questions from the podium since December 18, and she appeared just once in September, November, and December. The number of press briefings has steadily declining since Trump took office. According to data collected by The American Presidency Project, in 2018, the Trump regime averaged less than 5 press briefings per month, fewer than any president in recent history. CNN reported the lack of briefings is also a result of an ongoing power struggle for control between Sanders, Bill Shine, Kellyanne Conway, and Mercedes Schlapp on the communications team, going on for months. Also staffing of the White House press office has dwindled. Roles of many younger press aides who have departed, including “assistant press secretary” or “deputy press secretary” positions, remain unfilled. Unlike in past administrations, there has not been a rush of candidates to fill empty seats. The White House has not prioritized hiring, but Trump’s campaign is actively hiring for the 2020 re-election. On Tuesday, A. Wess Mitchell, the assistant secretary of state for European and Eurasian affairs, resigned effective February. The resignation comes at a time when Europeans are questioning Trump’s commitment to alliances. Mitchell’s departure creates another assistant secretary of state vacancy at the State Department. Six of the 24 spots have nominees awaiting Senate confirmation. Mitchell was the first assistant secretary under Trump. On Tuesday, Politico reported Shahira Knight, Trump’s legislative affairs director who acts as his liaison to Congress, is planning to leave in the coming months what many insiders say is a thankless job. Slate reported that the Trump regime’s Department of Justice’s Office on Violence Against Women quietly changed the definition of domestic violence last April with little notice, making the definition substantially more limited. Under the new definition, only harms that constitute a felony or misdemeanor crime may be called domestic violence, excluding critical components of the phenomenon like the dynamics of power and control. Rolling Stone reported Susan Combs, Trump’s unconfirmed appointee who is leading the Interior Department’s reorganization, earned almost $2.1 million in recent years from oil companies who stand to benefit. Combs, who was nominated by Trump in July 2017, has also been fiercely opposed to protecting endangered species during her time in Texas government — a position in line with the oil and gas industry. On Thursday, California Assemblyman Brian Maienschein, who serves in a conservative stronghold, announced he would switch parties and become a Democrat, blaming Trump’s behavior and divisiveness. On Thursday, the Golden State Warriors made their annual trip to Washington D.C. as NBA champions. Rather than visit the White House, the team was seen in photos visiting with former President Obama. On Wednesday, Trump sent a letter to Pelosi, saying he had checked, and that there were no such concerns from the Secret Service, and “therefore, I will be honoring your invitation” and delivering the State of the Union. Trump also told reporters, “It’s a great, great horrible mark.” Ronald Reagan’s address was postponed after the Challenger space shuttle exploded, but there is no precedent for a SOTU invitation being rescinded. On Wednesday, a CBS News poll found that 71% of Americans do not believe that Trump’s wall is worth the government shutdown, while just 28% believe it is. The poll found 47% believe Pelosi is doing a better job handling shutdown negotiations, to 35% for Trump. Also, 60% believe the shutdown is causing serious problems, 34% said some problems, 5% no problems. Trump’s approval fell 3 points from November down to 36%, while 59% of Americans disapprove, a high for his time in office for this poll. On Wednesday, a Politico/Morning Consult poll found 57% of Americans believe it is likely that Russia “has compromising information“ on Trump, compared to 31% who do not think it is likely. On Wednesday, an AP-NORC poll found Trump’s approval at a yearlong low of 34%, down from 42% in December. Trump’s standing with independents is among its lowest points of his time in office. The polls also found that 71% of women and independents disapprove of Trump, both up from 58% in December, and 76% of college graduates disapprove, up from 65% in December. The polls also found 60% of Americans blame Trump for the government shutdown, while just 31% blame congressional Democrats and 36% congressional Republicans. On Wednesday, Day 33 of the shutdown, led by several unions that represent furloughed federal employees and out-of-work contractors, hundreds of workers staged a sit-in inside the Hart Senate Office Building. Protesters stood in silence for 33 minutes, holding Styrofoam plates with messages like: “Jobs not walls,” “Will work for pay,” and “Please let us work.” The empty plates signified the need to feed their families. After the silence, protestors shouted, “No more food banks,” and, “They need paychecks!” Some staged a sit-in outside senators’ offices, and demanded a meeting with Senate Majority Leader Mitch McConnell. When McConnell’s office staff refused, a dozen took seats in the hallway outside his office, and were later pulled up from the floor and arrested, their arms zip tied behind their backs, by the U.S. Capitol Police. McConnell has also blocked legislation three times that would have opened other departments and agencies, arguing it would be a “show” vote because Trump will not sign it. On Wednesday, WAPO reported acting chief of staff Mick Mulvaney has pressed agency heads to provide him with a list by Friday of programs which would be impacted if the shutdown lasts until March or April. Mulvaney’s request is the first known by a top White House official for a broad accounting of the spreading impact of the shutdown. So far officials have been focused on the wait times at airports, but not other programs. Officials are already grappling with keeping their agencies functioning as unpaid workers refuse to show up. Over months, the impact is expected to extend to tens of millions of Americans who rely on government services. Federal workers will miss their second paycheck on Friday. Unions are filing legal action against the regime for making employees work without pay. Agencies are still trying to understand the scope of their problems. Other impacts include the federal court system is likely to halt major operations after February 1, and the Department of Agriculture will run out of funding to pay food stamp benefits in March to 40 million people. Kevin Hassett, chair of the Council of Economic Advisers, appeared to compare the shutdown to a vacation, saying it could leave workers “better off” since they will receive back pay and without having to report to work. On Wednesday, Michael Cohen indefinitely postponed his scheduled February 7 testimony to Congress, with his attorney Lanny Davis citing verbal attacks by Trump, including unspecified threats against Cohen’s family. Trump allies Reps. Jim Jordan and Mark Meadows also sent a letter to Cohen’s attorney, Guy Petrillo, suggesting Cohen would face aggressive questioning from House Republicans. Trump allies have privately said Cohen’s disclosures are one of the most significant threats to Trump. Cohen has spent more than 70 hours in interviews with investigators for the Southern District of New York and with Mueller’s team. On Wednesday, committee chairs Reps. Elijah Cummings and Adam Schiff said they understood Cohen’s concerns for his family’s safety and repeated their earlier warning against efforts to intimidate witnesses. That lawyer, Lanny Davis, in an interview on Thursday accused Giuliani of witness tampering for recent comments he made about Cohen’s father-in-law, suggesting he might have ties to organized crime. On Thursday, the Senate Intelligence Committee issued a subpoena for Cohen to appear privately before the panel next month and correct false testimony he delivered last year about the Trump Tower Moscow project. On Wednesday, House committee chairs Reps. Maxine Waters and Adam Schiff said they are planning to launch a joint investigation of Deutsche Bank over its business dealings with Trump. Waters asked Deutsche Bank for details of its handling of Trump’s accounts in May 2017, but the bank refused to cooperate, citing privacy. She now has subpoena power as chair of the House Financial Service Committee. On Thursday, Deutsche Bank AG said it received an inquiry from the two House committees on its ties to Trump. Reps. Waters and Schiff said they are in talks with the bank and expect its cooperation in its inquiries. On Wednesday, in a letter sent by committee chair Rep. Elijah Cummings to White House counsel Pat Cipollone, the House Oversight Committee announced it will investigate White House security clearances. The letter seeks information about security clearance issued for Jared Kushner, John Bolton, Michael Flynn, Michael Flynn Jr., K.T. McFarland, Robert Porter, Robin Townley, John McEntee, and Sebastian Gorka. Cummings said he also sent a letter to the National Rifle Association about Bolton, seeking information about his contacts with Maria Butina. Democrats vowed to subpoena Trump if documents are not turned over. On Thursday, NBC News reported Jared Kushner’s application for a top-secret clearance was rejected by two career White House security specialists, but was overruled by their supervisor, Carl Kline. Kline became director of the personnel security office in the Executive Office of the President in May 2017. Kushner was one of at least 30 cases in which he overruled security experts, approving top security clearance. The FBI background check on Kushner raised concerns about potential foreign influence on him, citing questions about his family’s business, his foreign contacts, his foreign travel, and meetings during the campaign. Kline recommended to the CIA that Kushner be granted “sensitive compartmented information” (SCI) clearance. CIA officials wondered how Kusher was granted top-secret clearance and denied the SCI request. On Thursday, Trump tweeted promotion of a book by conservative commentator Doug Wead, who had appeared on “Fox & Friends” that morning calling Trump the “most accessible” president in history. On Thursday, the Senate rejected dueling proposals to end the shutdown. The Senate voted 52-44 to reject House-backed legislation that would fund the government through February 8, with six Republicans joining the Democrats. The Senate also voted down Trump’s proposal by a 50-47 vote which would have provided $5.7 billion for his border wall and granted temporary protection for some undocumented immigrants. On Thursday, in an unplanned evening press availability, Trump claimed, “In fact, I see a lot of the Democrats — almost all of them are breaking saying, ‘Walls are good. Walls are good.’” This is a false statement. Trump defended Wilbur Ross, saying “perhaps he should have said it differently,” and claiming, without evidence, that grocery stores and banks “are working along” with furloughed federal workers. On Thursday, CNN reported the White House is preparing a draft proclamation for Trump to declare a national emergency. The questions of legality and legal challenges are the main hold ups in acting. Also $7 billion in possible funding for the wall has been identified: $681 million in Treasury forfeiture funds, $3.6 billion in military construction, $3 billion in Pentagon civil works funds, and $200 million in DHS funds. On Friday, in an early morning raid, FBI agents arrested Roger Stone at his home in Fort Lauderdale. In Mueller’s team 24-page document, Stone was indicted on seven counts of lying, obstruction and witness tampering. CNN video footage showed FBI agents at Stone’s door: “FBI. Open the door,” before adding, “FBI. Warrant.” The FBI agents who arrested Stone were working without pay given the government shutdown. The indictment said Stone sought stolen emails from WikiLeaks that could damage Trump’s opponents. In July 2018, Mueller indicted 12 Russians of orchestrating the hacks and distributing documents to WikiLeaks. The indictment also notes before Stone’s actions in the summer of 2016, the Democratic National Committee had already announced it had been hacked by Russians, implying Stone knew that too. The indictment said “a senior Trump campaign official was directed to contact Stone” about future releases by “Organization 1,” thought to be WikiLeaks. It was unclear who directed the senior campaign official. In an October 2016 email to Steve Bannon, then-campaign chief executive, Stone implied he had information about WikiLeaks’ plans. It was not clear if Bannon is the high-ranking official and his lawyer declined to comment. Stone tried to cover up what he had done by lying to Congress. He also tried persuade another witness, identified as “Person 2” — thought to be Randy Credico — to refuse to talk to the House Intelligence Committee. Trump also tweeted, “Who alerted CNN to be there?” echoing a tweet by former Fox News host Greta van Susteren, who falsely claimed the FBI had tipped off CNN to cover Stone’s arrest. CNN monitored grand jury activity. Stone appeared in a Fort Lauderdale court with steel shackles on his wrists and ankles Friday morning, and was released on a bond. On the courthouse steps, he made the V-for-victory gesture used by Richard Nixon. With Stone’s indictment, the Mueller probe has now led to charges against 34 people and guilty pleas by six Trump associates and advisers. Stone got his start in politics working for Nixon’s 1972 re-election campaign. Agents also moved to search Stone’s New York City apartment. His case was assigned to assigned to U.S. District Judge Amy Berman Jackson of the District of Columbia, who is also hearing Paul Manafort’s case. On Friday, House Intelligence Committee chair Adam Schiff said his committee will release all interview transcripts from its Russia probe to Mueller, citing Stone is second witness to be indicted for lying. On Friday, TSA Administrator David Pekoske tweeted that the department had scraped together funds left over from last year to make a “a partial payment” to TSA screeners for the first two-weeks of the shutdown. On Friday, WAPO reported at least 14,000 of the 26,000 unpaid Internal Revenue Service employees, whose work includes tax processing and call centers, did not show up this week after being called back last week. On Friday, the Federal Aviation Administration announced it was restricting flights into and out of New York’s LaGuardia Airport, saying there were not enough air traffic controllers to manage flights safely. Within hours, delays at LaGuardia had a ripple effect on other East Coast airports. The FAA’s action was the first time staffing shortages hit air traffic control centers during the shutdown. On Friday, an ABC News/Washington Post poll found Trump’s approval at 37%, one point off the low in his first two years, as 60% of Americans disapproved of his handling of the shutdown. Trump’s two-year average approval rating of 38% is the lowest on record for a president in 72 years of polls, compared with an average of 61% for the 12 previous presidents since 1945. The poll also found Trump’s approval among women dropped to a new low of 27 %, down 9 points since November, while 49% of men approved. His rating with independents dropped to 32%, matching its low. Shortly after the FAA’s action, the White House announced Trump would address the press from the Rose Garden. In the afternoon, cabinet officials and White House aides lined the sides and applauded him as he spoke. Trump claimed victory, saying he was “very proud to announce” what he called “a deal to end the shutdown and reopen the federal government.” The government would reopen for three weeks with no funding for his wall. At a joint press conference after the speech, Pelosi and Senate Minority Leader Chuck Schumer thanked federal workers for working a month without pay. Rather than accepting credit, Pelosi praised the unity of her caucus. Late Friday, Trump signed a bill to temporarily reopen the government, ending a 35 day shutdown, the longest in the nation’s history. Over one million government contractors will not be reimbursed for missed pay. On Saturday, NYT compiled a list of more than 100 in-person meetings, phone calls, text messages, emails, and private messages on Twitter that Trump and his campaign associates had with Russians during the 2016 election. Gizmodo reported that some of Trump’s photos on Facebook and Instagram have been manipulated to make him appear thinner, and to make his fingers appear slightly longer. Roger Stone, a former advisor to President Donald Trump, exits the Federal Courthouse on January 25, 2019 in Fort Lauderdale, Florida. 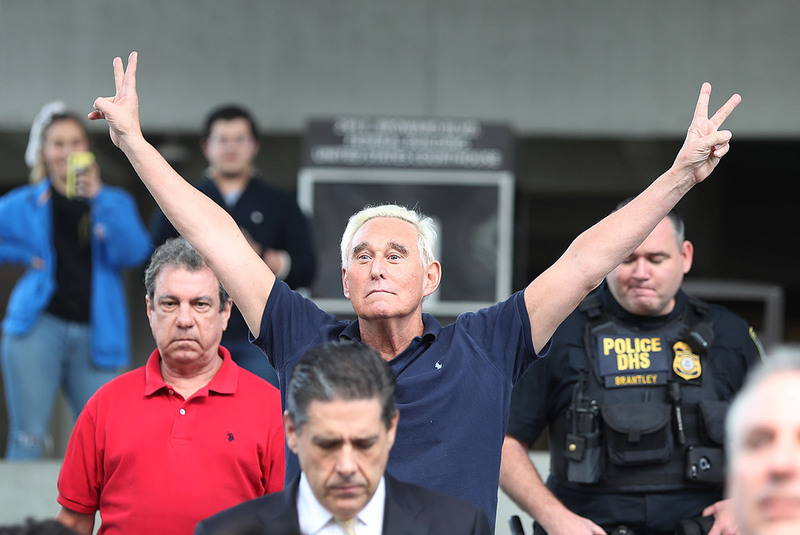 Stone strikes the famous pose of his personal hero, the late former president Richard M. Nixon, by raising his arms high and making V-for-victory signs with his fingers.